Mango Moon Yarns has been on a steady growth track. As a wholesale yarn distributor over the last few years they have been selected as Norway based Dale Garn Yarns exclusive North American distributor. Continuing on their mission to keep knitting fun, BeSweet Yarns was added to the family in 2014. Although the family of businesses serve the yarn, knitting, and craft industry each company has distinct features. The three different websites were in different software versions making editing difficult. All three companies are known for offering wholesale yarns to the industry. Each company also has the potential for e-commerce retail sales. There needed to be a clear definition from the wholesale purchases and retail e-commerce sales. 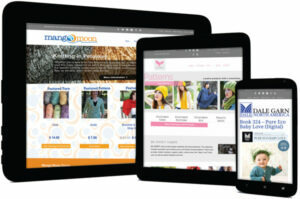 All websites were designed within one responsive WordPress theme for ease in updating. Because each companies products compliment each other it made sense to link them together. Visitors to go from site to site yet the administrative areas are seperate to keep editing simple. Because they are not in competition with each other the websites can be linked while also stand alone. Less time with updates, consistency between websites and companies. Products showcased more professionally. Works well on a all digital devices. Ease in online orders. Lookbooks capture visitors interest and keep them on the website longer. By connecting the three companies each website is enjoying more visits and sales by being linked together. We really like the cohesiveness across the three lines, while still keeping the brand identity of each line intact. We have received positive feedback from some of our customers who have noticed the improvements. We also really appreciate the cleaner, more modern appearance. We love that you went out of your way to make it easy for us when we were a brand new business. You understood that cash flow was an issue for us, and found ways to improve our site that we could afford. We like the catalog versions with the animated page turns very much…we are happy campers.